"Munch some of these onions. They'll make your voice stronger." Sadly, today Roscoe "Fatty" Arbuckle is known primarily for the 1921 scandal in which bit player Virginia Rappe ended up dead. Although acquitted of any wrongdoing in her death (indeed, the jury demanded that the prosecution apologize to Arbuckle), Fatty's career as one of the top funnymen in motion pictures was completely destroyed by the tabloids. Taking his place was his protege and co-star, Buster Keaton. After leaving Mack Sennett's Keystone studios, Arbuckle started to produce his own two-reel shorts in 1917. As luck would have it, the very first one, The Butcher Boy featured Buster Keaton in his screen debut. Of course, Keaton was hardly a newcomer to slapstick. Though only 21, he had 18 full years of experience on the vaudeville stage as part of The Three Keatons, where he spent many years as The Human Mop, being tossed through scenery and off furniture from the age of three. 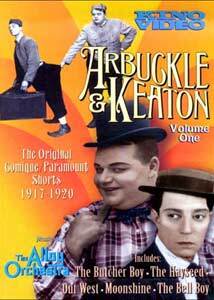 Collected on this DVD and its companion disc are ten of the fifteen comedies which Arbuckle and Keaton made; of the other five, three are believed completely lost and one exists only in a fragmentary state. The other film is held only in the Norwegian Film Archive and apparently was unavailable for inclusion in this set. Through these comedies, we see the development from a lowbrow pure slapstick to a more subtle and relatively refined gag work which also involved stellar stunt work by Keaton. Volume One starts off with one of the best of the collaborations, The Bell Boy (1918). Fatty and Buster are bellboys at the Elk's Head Hotel, and their ineptitude is remarkable. Arbuckle has a very funny shaving routine where he transforms a furry-faced customer (whom he describes as Rasputin the Mad Monkey) consecutively into U.S. Grant, Lincoln and the Kaiser, the latter of whom gets a pie to the face. Fatty, as is usual in these comedies, is after a young lovely (often, as here, played by Alice Lake). In this case, it is Miss Cutie Cuticle, the manicurist. Seeking to impress her, Fatty sets Buster and Al St. John (Fatty's real life nephew) to perform a phony bank robbery that he can foil and appear as the hero. Some wild stunt work follows as the phony bank robbery coincides with the genuine article. The Butcher Boy (1917) is Buster's debut, and he has a small but important part as a customer who wants to buy some molasses at Fatty's store. From the beginning, Keaton is seen in his trademark straw boater. Arbuckle displays near-ginzu quality knife juggling that is quite impressive. This time, Fatty is after sweet Almondine (Josephine Stern), and when she is sent off to boarding school, Fatty follows in drag as her younger (but much huger) cousin Saccharine. Al appears as Fatty's rival, Alum, and he too goes to the boarding school in drag to try to win Almondine. Although some of the earlier gags are clever, the boarding school sequence soon becomes a tiresome series of drag jokes that go nowhere. In Out West (1918), Buster is Bill Bullhorn, owner of the Last Chance Saloon, a joint so tough there are chutes in the floor to dispose of the bodies. Fatty stumbles into town and is hired as the new bartender (the prior one having just been shot moments before). The scene soon degenerates into racial cruelty as Fatty and the customers shoot at the feet of a black man to make him dance. Alice Lake, as a Salvation Army worker, soon puts a stop to this. Al St. John co-stars as a bandit determined to get Alice for himself; Fatty has a funny sequence in which he tries to subdue Al by breaking bottles over his head, but all without effect. A clear predecessor of Keaton's later feature Go West, this short is a clever and dry-witted satire of the Western melodramas of the time. Already we see Keaton's character as the Great Stone Face coming into being here as he neither cracks a smile nor displays any other emotion. Unfortunately, Moonshine (1918), a funny self-satire of Arbuckle's own filmmaking style, is presented here only from a contrasty 16mm print. That's too bad, because this appears to be one of the better shorts on the disc, with numerous instances of breaking the fourth wall. For instance, as revenuer Fatty meets Alice Lake, the daughter of the moonshiner, and throws her in the lake, Alice immediately falls in love with him. When her father questions the rapidity of this development, Fatty answers him calmly, "This is only a two-reeler. We don't have time to set up the romance." Early on there is a nifty photographic trick (pioneered by Keaton) to allow a veritable army of revenuers to pile out of Fatty's car, in the ultimate clown car joke. A sharp satire of stage melodramas, Moonshine is memorable and funny as well. Wrapping up the package is The Hayseed (1919), another comic look at a general store much like that in The Butcher Boy. When Roscoe goes out to deliver the mail (stymied by an oversized letter, he tears it up into tiny pieces and stuffs them into the mailbox), he meets up with his sweetheart, Fanny (Molly Malone). Distracted immediately, he gets involved in a game of hide-and-seek that has disastrous consequences. The jealous rival this time is the local constable, played by John Coogan (father of Jackie Coogan, later star of The Kid and Oliver Twist). The constable lifts some cash from an insured letter that Fatty has left unattended and buys Fanny a ring. An excellent sequence follows where Buster, on the store roof, battles the constable by hurling pails of water down upon him. Later that night, the store is converted into a dance hall, and everyone takes a turn at entertainment. When Fatty shows up the constable, Coogan accuses him of the theft. In an eerie foreshadowing of the Rappe case, Fatty is falsely accused and abandoned by his friends (though here it is for eating too many onions before singing a maudlin song). This collection is full of excellent slapstick, with a variety of clever tricks and frankly astonishing stunts, all done practically. Unlike the Chaplin two-reelers, which can only be taken in small doses, the Arbuckle/Keaton films can not only be watched in quick succession (the only gag repeated is a brief one on oiling the joints of a horse) but they also bear repeated viewing without losing much of their humor. This set of discs now makes nearly all of Keaton's silent work available on DVD from Kino, with the exception of the two features that he did for MGM (The Cameraman and Spite Marriage), which are now controlled by Warner Bros. Given Warner's reluctance to release catalog titles may preclude us from ever getting those last two features on DVD, but this set will help assuage that loss with several hours of brisk laughter. Image Transfer Review: All of the films on the disc besides Moonshine are taken from 35mm masters. The detail visible is often dazzling. There is some flickering and speckling throughout, but these films are over 80 years old and we should be glad they exist at all. These four films are not overly contrasty and have decent black levels and grey ranges. Attractive and subtle tinting is added, though in The Bell Boy some scenes which are clearly intended to be set at night are not blue-tinted, apparently by oversight. There is occasional frame damage, but not to a distracting level. Moonshine, on the other hand, taken from a 16mm print, is barely watchable. The contrast levels are so high as to erase any detail. It's a shame because this is such a good comedy, but apparently this was the best source material available. The image of this short rates about a D; the others about an A- when their age is taken into account. Audio Transfer Review: The audio is a newly recorded score composed and performed by the Alloy Orchestra, which has appeared on a number of silent DVDs so far. As befits slapstick comedy, the music is comparable to Danny Elfman's score for Pee-Wee's Big Adventure, and hardly ever stops for breath. Full of rollicking good humor, the score is a definite plus to this disc. Hiss and noise are nonexistent, and the sound comes through crisply and clearly, with good bass extension. Extras Review: Other than a single page of notes on the insert, there are no extras present at all. This is rather disappointing with such historically important shorts. Chaptering is rather inadequate as well, with only 3 chapter stops for each two-reel film. This disc and its companion DVD display silent slapstick at its finest and should help redeem the memory of Fatty Arbuckle. To my mind, these are much funnier than Chaplin's much-vaunted two-reel films and are a worthwhile addition to anyone's library.